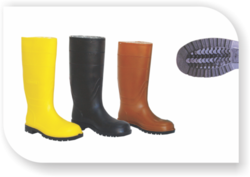 Being one of the leading firms, we ensure high quality Polyvinyl Chloride Gumboot are delivered to the customers. They are widely demanded these days and are used as personal protective equipment in various industries including oil industries, construction, sewer & garbage, mines, electricity and for many such works. We provide, these gumboots to our customers in variety of sizes, colors, soles and can also be customized in accordance with the requirements of the customers. The product is packed very carefully to ensure its safe delivery till the customers end and is available at very reasonable rates to our customers. Packaging Details: THE PACKING IS 1 CARTON ADD 10 PAIRS GUMBOOT & PER PAIR WITH INDIVIDUAL BAG.